This past week, we launched a new venture: a weekly podcast focused on Indian politics we’re calling “Grand Tamasha.” Each week, we will break down the news in Indian politics, and go behind the headlines for deeper insight into the questions facing Indian voters in the 2019 general elections and beyond. The podcast is a co-production of the Carnegie Endowment for International Peace and the Hindustan Times. Each week from now through the elections, we’ll release a new episode Wednesday morning IST (Tuesday night EST). In our first episode, Sadanand Dhume (Resident Scholar, American Enterprise Institute and Wall Street Journal columnist) and Sukumar Ranganathan (Editor-in-Chief, Hindustan Times) discussed the aftermath of India’s targeted military strikes against Jaish-e-Mohammed (JeM) terrorist camps in Pakistan. I also sat down with Arvind Subramanian, the former chief economic adviser to the Government of India, about the idea of a universal basic income (UBI) for India. As the global democratic reform movement is agitating for more transparency, disclosure and openness in political funding, India is rapidly hurtling in the opposite direction. India has earned a reputation for often bucking global trends. But here is one domain where India’s innovation is hardly cause for celebration. This issue is going to get loads more attention as the race for 2019 heats up. You can read the full piece here. p.s. The entire special issue of Seminar is worth reading. It has smart essays by Yamini Aiyar, Mihir Sharma, and my colleague Srinath Raghavan, among others. You can read them all for free here. I recently did an interview with Archana Masih of Rediff on the state of the 2019 campaign. We touched on everything from nationalism in India to the Budget and the health of India’s institutions. Can a united Opposition give a good fight and turn the tables? Or is the BJP now a well oiled election-winning machine, despite the setbacks in the assembly elections? The united Opposition can definitely give the BJP a good fight. But I start from the premise that this remains the BJP’s election to lose. It possesses a lot of advantages. Modi remains the most popular politician in India; the BJP’s organisational and fundraising prowess is considerable; and the Opposition, while newly collaborative, has no leader or clear economic messaging as of yet. There are many people confidently predicting that Modi will be a one-term prime minister; I think that is very premature. The national campaign has not yet begun in earnest and he has every incentive to presidentialise this election, as he did in 2014. One thing we know is that campaigns do have an independent, causal, impact on people’s voting decisions in India. In a new piece for Foreign Policy, I try and decode the meaning behind Priyanka Gandhi’s surprise entry into electoral politics as part of the Congress Party campaign in 2019. Priyanka Gandhi play is not only about winning allies and lifting spirits; it’s also about cash. The party is short of it, and Gandhi substitutes for the political finance that the Congress desperately needs. Read more about my take on the “Priyanka-as-political-finance” strategy here. In our latest “India Elects 2019” essay, Jamie Hintson and I look at the battle for Uttar Pradesh. 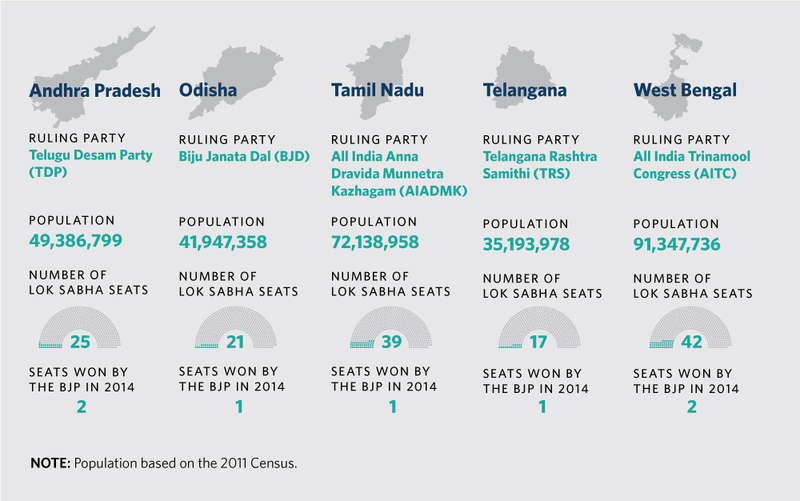 Rather than wade into the guessing game around seat forecasts, we focus on three issues critical to sealing the final UP outcome: voter mobilization, Hindu voter consolidation, and rural anxiety about the economy. Insiders have long claimed that replicating 2014 is a pipe dream for the BJP. The last general election result was a perfect storm of anti-incumbency voter bias, a slumping economy, and a presidential contest with only one compelling candidate. While a sweep of UP may no longer be in the cards, the BJP must retain a strong majority of seats there. To have a shot at doing so, the party will have to energize its base, keep its coalition from fracturing, and address (or, more accurately, be seen to address) the needs of India’s rural dwellers. If it fails, a second term could be jeopardized. To paraphrase an old U.S. electoral maxim: as Uttar Pradesh goes, so goes the nation. New column: a UBI for India? On the eve of general elections, there is an increasingly heated debate in India over the wisdom of introducing a universal basic income for its poorest citizens. This public conversation was triggered by Congress President Rahul Gandhi’s announcement on Monday that, if elected to power, the Congress would introduce a minimum income guarantee for all poor households. I have a short piece in the Washington Post on the Congress announcement, which came on the same day as a new proposal by Arvind Subramanian and colleagues for a QUBRI–or quasi-universal basic rural income. The latest essay in our “India Elects 2019” series explores the BJP’s prospects of expanding its reach along India’s Eastern seaboard. The saffron party is eager to make inroads along the East coast in hopes that victories there can compensate for almost certain losses in the Hindi belt. In the piece, Jamie Hintson and I take a state-by-state look at the BJP’s prospects. The image below shows how things stacked up in 2014. You can read the entire essay here.